The long awaited transition of Ocala Speedway from a paved race track to a dirt racing surface has officially begun. At 6:30 AM this Saturday morning, dump trucks lined up at a local clay pit to receive their first loads of Florida clay, and by 8:00 AM the first loads were arriving at the pit entrance to the speedway. There was no fanfare and no crowd waiting. Just Michael Peters, Angie Clifton, and a couple of others. And as the trucks made their way across the infield to turn 3, the spectators followed. Within a couple of minutes history was made as the first load spilled onto the asphalt, almost right in front of the towering Ocala Speedway scoreboard. More dump trucks began arriving, and as the steady stream of loaded trucks made their way down the highway to the track, it began to attract attention. As more trucks arrived so did more people, and by 10:30AM a small group of racers and fans were taking in the process from the infield. Even Rich Pratt found himself joining the group, watching as more and more asphalt faded from sight. First it was turn 3 that was covered, then the back stretch and part of turn 4. By lunchtime half of the track's 3/8ths mile was under a layer of rich, sticky, Florida clay. For Ocala Speedway owner Michael Peters, this was the giant step forward that followed months and months of painstaking research, planning, and hard work. And as he pointed out, this is really just the beginning. One hundred truckloads of clay were scheduled to be hauled in on Saturday, with yet another one hundred scheduled for Sunday, and even more in the works for Monday too. As the trucks dump their cargo the heavy equipment moves in, spreading the clay and packing it down before the next truck backs into place and dumps yet another load. The clay going onto the track today is the base layer of extremely heavy and sticky clay. Later that will be followed with more clay of a slightly different makeup, which when worked in with the sticky stuff will give a racing surface with just the right amount of bite and resiliency. In all there will be three different clay mixtures added and worked in together to achieve the final high quality surface that is desired, and over the coming month and a half there will be a constant effort at getting that surface delivered and spread, then making it perfect for the best quality track surface in Florida. In the meantime much more is going on in addition to loads of dirt covering the asphalt. Michael Peters has been busy getting the rules prepared and posted on the Ocala Speedway website, which is www.OcalaSpeedway.com. Rules for most divisions are now posted along with the new general rules, and they will remain posted and will be updated as needed. This will allow feedback from racers and fans, and changes in the rules are possible before January 1st. After the first of the year the rules will be permanent and changes will no longer be permitted, so it is important that any concerns or questions be addressed now instead of later. There are other operational changes underway as well, and those are highlighted on the manager's page on the Ocala Speedway website. There racers will find information on the use of raceceivers which will be required in 2008, plus information on the new UMP national points for most divisions. As more information becomes finalized it will be posted and racers are urged to keep checking back as time for the 2008 season to start draws closer so that they will be prepared to race. Once the new racing surface is in place the big question is when will everyone get their chance to try it out? The current plan is for at least three weekend practice sessions in the month of February, leading up to the grand reopening of the track the first Friday in March. This will allow the asphalt racers a chance to acquire some seat time on dirt, and allow dirt racers to acquaint themselves with Ocala Speedway's odd shape and layout. More information on these practice sessions will be posted at a later date. And as all of this is going on there is even more planning and preparation in process as well, including a job fair that will help find a unique and talented staff for 2008. Angie Clifton plans to conduct interviews and make her choices the second week in January, which will allow time for training and learning the new way that Ocala Speedway is going to operate when the fans arrive at the gates in March. And according to her and Michael Peters, the fans will see far more than just racing when it reopens. They will see a show each week which includes racing, and it will be like nothing Florida race fans have ever experienced. For now the focus is on dirt, dirt, and more dirt. 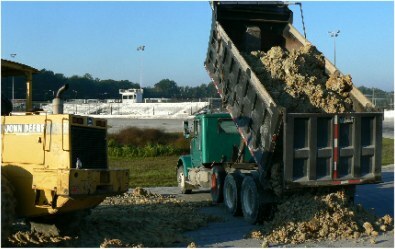 Getting it delivered, spread over the track, and mixed to the proper consistency. Workers are taking it slow, being careful to do the job correctly, all under the watchful direction of Michael Peters and his crew. Before long the paved surface should be completely out of sight, totally covered by the same sort of Florida clay that racers originally raced on back in 1955. Ocala Speedway's roots are in the clay, and so is it's future.